Apple is famous for its well-designed hardware and software. Much of their success is due to innovative products combined with smart marketing. They have always had their own way of doing things. If you’re an Apple fan you have probably seen that famous yellow post-it note. We’re of course talking about the “maintenance” page that Apple puts up at Apple Store every time they are about to release something new. And this is where the magic happens. It’s like one of those Pavlovian conditioned reflexes: When Apple Store is taken down, the web start to buzz. Will they release new products? What will they release? When will Apple Store be back up? They have managed to take something most people consider a big negative, i.e. downtime, and transformed it into something positive. Apple Store downtime is a delimiter, an indication of something new to come. It has become an automatic buzz creator. If Apple releases a new product, it will of course be talked about anyway, but with this additional marketing trick they have added another layer of anticipation, another thing to talk about and set off speculation. This has been going on for years. Apple has managed to create a massive PR machine at the cost of closing their online sales for a couple of hours, and they have done it so consistently that they have trained Apple users and journalists alike to react this way. They could basically just take down Apple Store and the word would spread automatically that something is about to happen. Who else would get this huge, positive reaction by taking down their online store for a few hours? 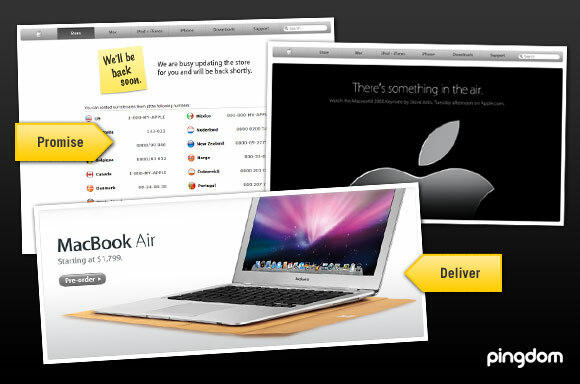 The last example was last Tuesday, January15, when Apple released Macbook Air. During this launch Apple Store was down (for “maintenance”) between 15:20-19:40 CET and then again 20:05-20:20 CET, a total of 4 hours and 35 minutes according to Pingdom monitoring. Any doubts that this is creating buzz? A search for ”apple store down” on Google gives 21,000 results. A search for ”apple store down” on Technorati in blogs with a lot of authority gives 43,238 results. And this is a typical reaction. It seems pretty clear that this is an intentional, and quite ingenious, marketing stunt from Apple. No other online store takes down their site on purpose to update with new products. Even the most simple e-commerce system doesn’t need that. You really have to love them for pulling this off. Downtime is hated everywhere, but somehow everyone cheers when Apple Store goes down. Now that’s an accomplishment. You know I never even thought that it would have been a marketing stunt. Apple obviously has the technology to merge in new products into their online store with zero downtime, but to create the “apple buzz” by faking downtime is true genius. Props to Jobs for not only making lemonade out of lemons, but for faking the lemon problem in the first place.